If you are looking for a fast M4V converter for media players like iPod, iPhone, iPad, PSP, Zune, Blackberry, Creative Zen, etc. 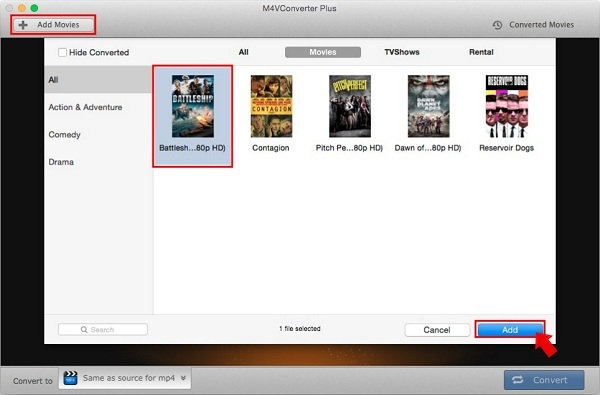 M4VConverter Plus is such a powerful M4V conversion software for protected movies, TV Shows from iTunes Store. M4V Converter Plus is newly optimized with h264 video hardware compression technology, which can be supported on most of Mac. With the new technology, M4V Converter Plus will convert M4V videos with more faster converting speed and better quality. The output formats with auto video codec can always work with the technology. And it is easy to set the output format with the parameters. With the fast M4V converter, you will get the DRM free videos to play on any players. Ignoring how the technology of underlying code works, you just need know what powerful functions M4V Converter Plus has. It can help you keep the chapters, clip the video, retain the audio track, convert as diverse output formats. With M4VConverter Plus, you can remove DRM protection from M4V with fast converting speed indeed. 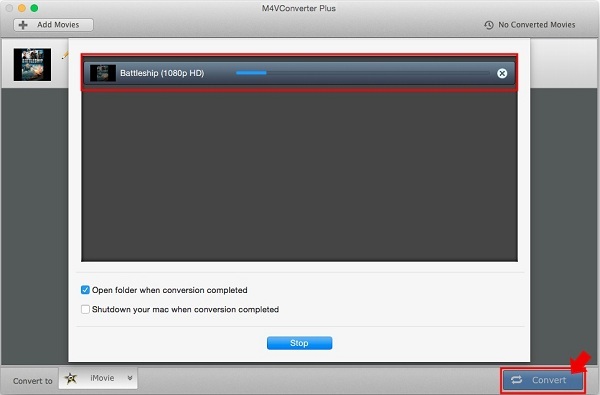 Here are the simple steps how to convert M4V fast with M4V Converter Plus. Click the Add Movies button to open the adding window, select one movie on the Movies tab and click the Add button to add. Click the Convert to profile list and select the Same as source for mp4 as output file format in the drop-down list. And just keep the Video and Audio Settings as default. When the video contains multiple audio tracks, you can click the audio settings to select your favorite one to save. Keeping one audio track will make converting faster than keeping all. Click the button Convert to open the converting box to start M4V to MP4 converting. Just waiting for a few minutes, the conversion will finished and you can find the output video in the Converted Movies list. 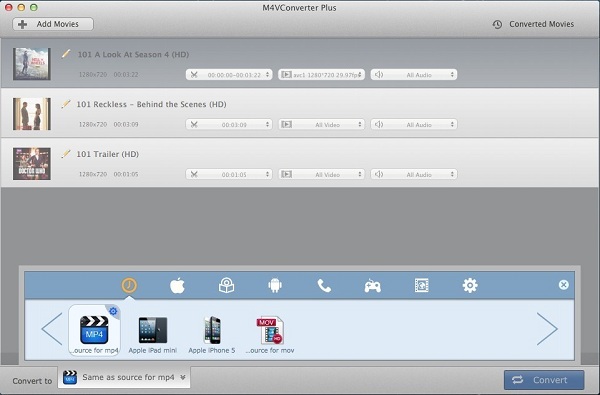 With the excellent and easy-to-use M4V converter, M4VConverter Plus can help you remove the DRM protection from iTunes M4V videos with perfect output quality and high conversion speed. And the video without DRM protection can play well on the player.